Find Fans-Only Offers in Xilisoft Facebook Page. Download free trial of all Xilisoft products here! 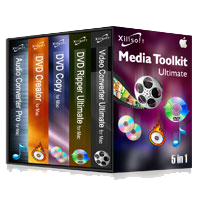 A multimedia bundle includes Video Converter Ultimate for Mac, DVD Ripper Ultimate for Mac, Audio Converter Pro for Mac, DVD Copy for Mac and DVD Creator for Mac. Mac DVD ripping, creating, copying and video/audio converting functions are included. Convert DVD/video/audio to iPhone files on Mac, transfer files between Mac and iPhone. Convert DVD and videos to iPod files and transfer files from iPod to Mac/iTunes and Mac to iPod. Convert DVD and videos to iPhone video MP4/MPEG-4 and audio MP3, M4A for Mac users.